The new 7060 67 horsepower 4WD cab tractor from Mahindra Australia was launched this month joining the 8560 4WD Cab tractor in the 60 series range. Sagar Bhadkamkar, National Manager for Australian operations explains “The new 7060 Cab tractor represents the best value on the market with the highest operating weight and lift capacities, at this price point.” The 7060 4WD Cab tractor is a heavy duty utility tractor and will be ideal for use by dairy farmers, hobby farmers, orchard farmers and horse stables. The 7060 Cab tractor is a 60-70 horsepower tractor with a 2.3 tonne lift capacity that is capable of safely feeding out bales without the cost of a larger machine. Accessories that include sun visors and storage area. 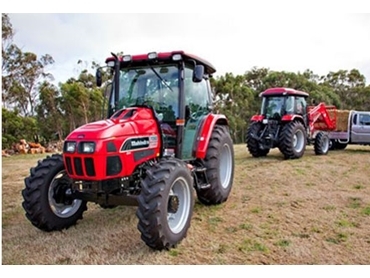 For more information about the range of tractors available from Mahindra Australia please visit the website.